Much of what I intended to place in the introduction of this topic has already been described by Alastair McIntyre at http://www.electricscotland.com/webclans/family_tree_dna.htm. In fact, he already shares his results somewhat, but not exactly, as I intend to share mine, so don't forget to use the BACK button of your browser to return. The home page for Family Tree DNA is http://www.FamilyTreeDNA.com. I, too, received a welcome letter, a page of testimonials, clear instructions how to do the test (for 99.9 per cent accurate results), an optional release form (on which I printed Scotland for patrilineal origin and Ireland for matrilineal origin), and a return envelope for the plastic bag with the kit number. 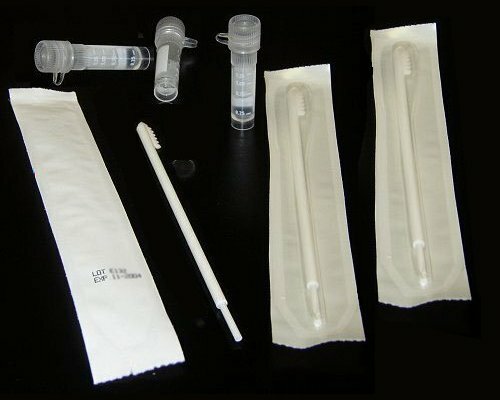 My kit contained three swab scrapers and collection tubes with a plastic envelope. The website for the Y-DNA Surname Project for Ross has currently 129 members (of the 228 whose surnames begin with R). See http://freepages.genealogy.rootsweb.com/~cherietree/RossFamily/rossdnaprojecthome.htm. "Those who want to, once and for all, put to bed the family lore that you are related to the family from Ross Castle in Kerry Ireland; the original Ross clan chieftain Fearchar Mac-an-T-Saigart of Balnagowan Castle, Scotland; the Antarctic explorers Sir James Clark Ross and Sir John Ross; John Ross, husband of US flag maker, Betsy Ross; or to Cherokee Chief John Ross (or other famous / infamous people). . . DNA testing is the way." My . . . that is a delightful carrot, if only FTDNA can "put to bed the family lore". "The project uses high technology DNA analysis to determine whether families share a common ancestor. The male chromosome is passed down virtually unchanged from father to son. So, two male Ross 7th cousins would have virtually the same male DNA pattern. This scientific fact is useful in genealogy when one does not have documentary records to show a family connection despite circumstantial evidence that suggest a family connection. If the DNA of the descendants of the branches one is trying to connect do not have the same DNA pattern, then one knows they are not closely related. If the pattern does match, then there is a common ancestor at some point in the past lineage. The technology can't pinpoint how many generations back the ancestor is, but it can tell us if there is a common ancestor." FTDNA-YDNA also allows you to identify your ethnic and geographic origins (Haplogroups), both recent and far distant. On July 11, I received an email confirmation of my order for the Y-DNA37 test with the sample kit number of ******. The cost of US$125.00 would be charged to my credit card. On August 25, I received an email notice that kit #****** had been received by Family Tree DNA with instructions about obtaining information about the progress at the lab. * The above expected date is a target used by the lab. Actual date may vary by a few days. A very small percentage of the tests do not return conclusive results during the first run. In other words, those samples did not produce a reading that would allow for our lab to determine with 100% certainty the values for one or more markers. When this happens we re-test the sample. 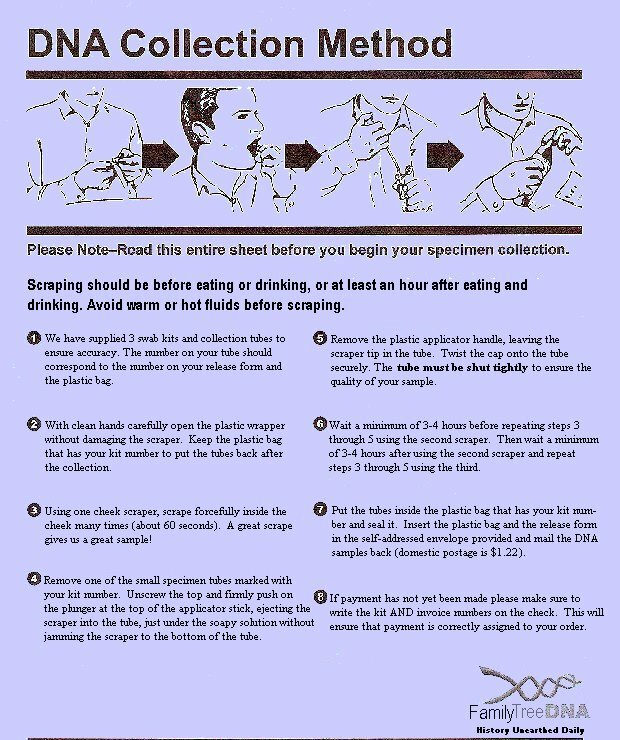 This procedure is repeated up to 3 times after the initial test fails (one more time with Vial A, and if the result is still inconclusive, 2 additional times with vial B). if at the end of the process we cannot determine reliable results (extremely small percentage of cases), this is generally attributed to a poor scraping, in which case we send you vials C and D for a new scraping. 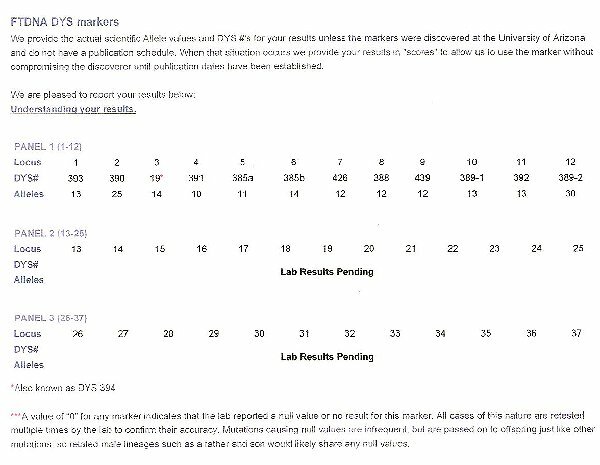 My FTDNA 12 Marker results were received on September 15 and my results for the 25 and 37 Markers were promised in one or two weeks. The schedule formerly indicated that the latter results might not be ready until the end of October. The Y-chromosome contains millions of bits of information,each of which is encoded by a "base pair". Analysis of every base pair is not practical for genealogical study, so only certain specific chromosome locations, known as "markers" are used. "DYS" is short for "DNA Y-chromosome Segment", and is used to designate a segment of DNA on the Y chromosome where a sequence of nucleotides repeats. These sequences are known as short tandem repeats (STRs), and are called markers in genealogical DNA testing. The possible variations of repeats at a DYS marker are known as alleles. Please note if the number of people reporting a particular country is too small, no percentage will be calculated and N/A will appear instead. Percentages above 2% are considered significant indicators of your family's origins. Percentages above 4% may be interpreted as highly significant indicators of your family's origins. I had 5 exact matches and 32 matches at a genetic distance 1 (i.e. a mutation in 1 marker) for people on their list. 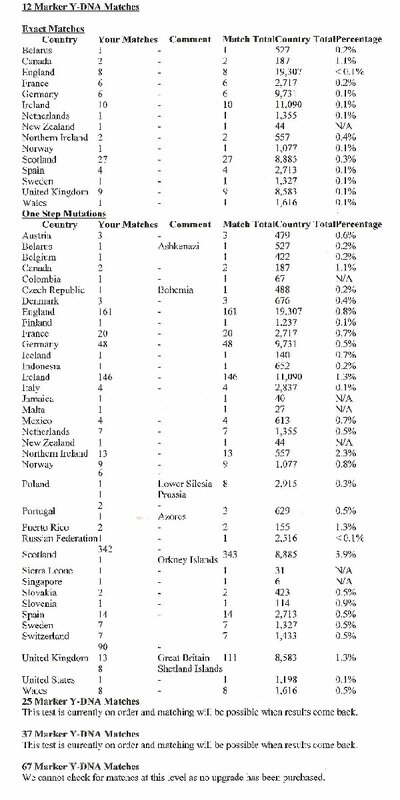 Fifteen countries are listed under exact matches and 37 countries (not including small regions) were listed as matches at a genetic distance 1. Deep Clade Tests are available for haplogroups E, G, H, I, J, N, O, Q, and R, and since I am in haplogroup R1b1b2, I qualified for the Deep Clade Tests. I may go for that after I join the Ross Clan group for a discount in the costs. The purpose of the Deep Clade test is to confirm your haplogroup assignment and determine where your lineage fits within that haplogroup's tree. Some haplogroup branches are found within more specific populations and geographic locations. As research progresses, more geographical specificity associated with SNPs will emerge. Evidently, my type of DNA mutation may involve a Single Nucleotide Polymorphism (SNP), which is a change in a single base pair on the DNA molecule - - - and these are very rare on the Y-chromosome. 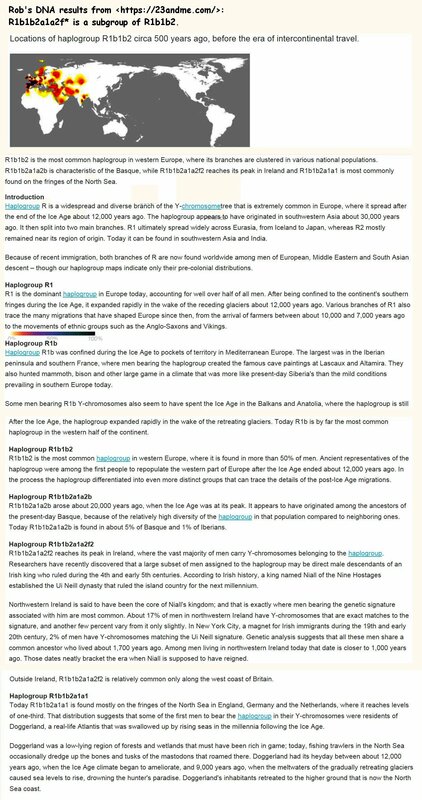 This could be very useful in defining my Haplogroup more precisely. 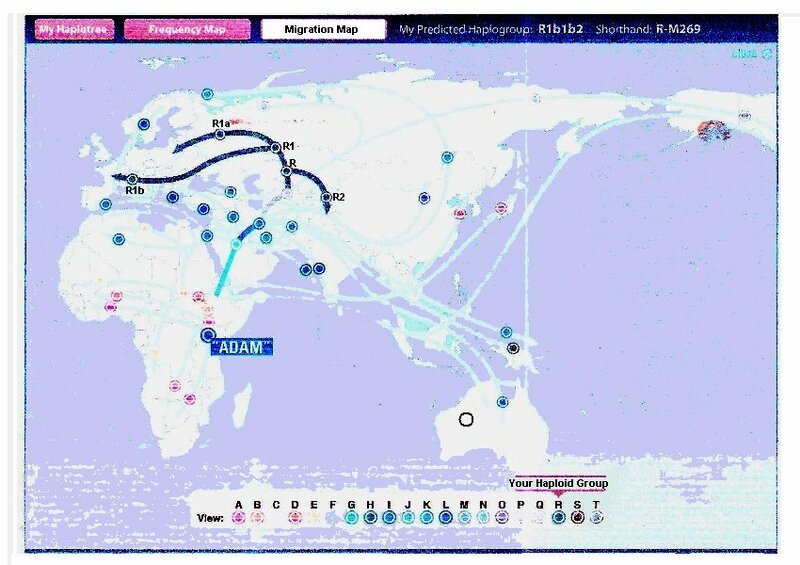 CLICK on the Migration Map below to double size. My FTDNA 25 Marker results were received on September 22 and my results for the 37 Markers were promised in another one or two weeks. 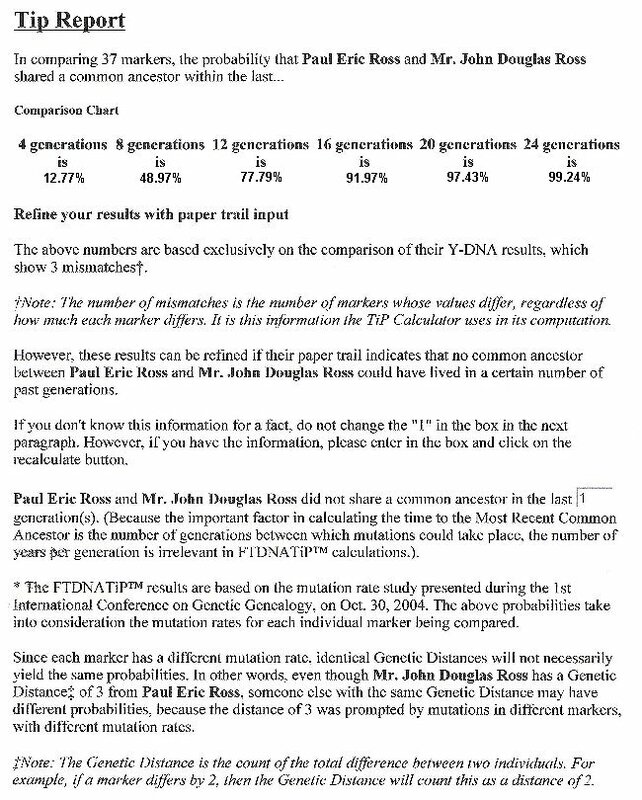 There were some minor changes in the FTDNA 12 Marker names for some reason, but the remainder of the report (below) tempted me to add my results to Ysearch.org, the FTDNA-sponsored public database. Thus far I am not too impressed with Ysearch, because it is too cluttered with unrelated connections and its use is repetitiously hampered by unfriendly devices to prevent hackers and spammers. WOW! The FTDNA 37 Marker results came through on September 23. 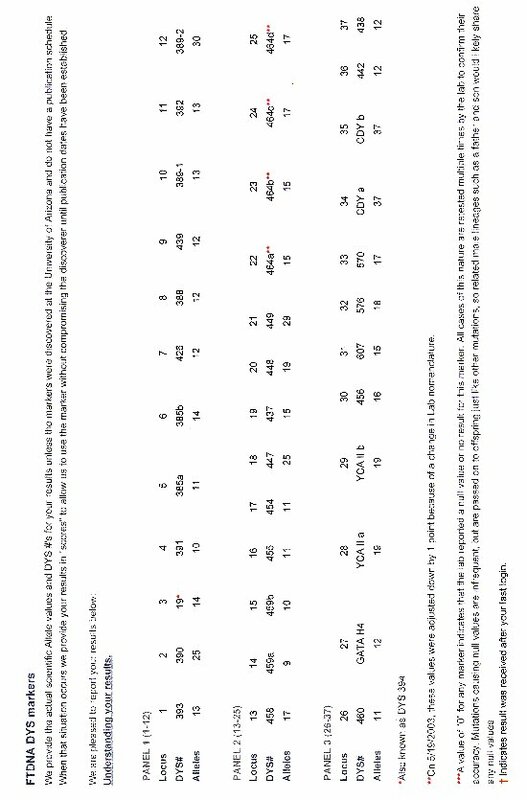 These results plus a Tip Report for the only match for the 37 Marker genetic distance 3 are shown immediately below. I was fairly certain that we did not share a common ancestor in the last 4 generations, so I had the results recalculated for the Tip Report. Here are the FTDNA DYS markers for all three tests. 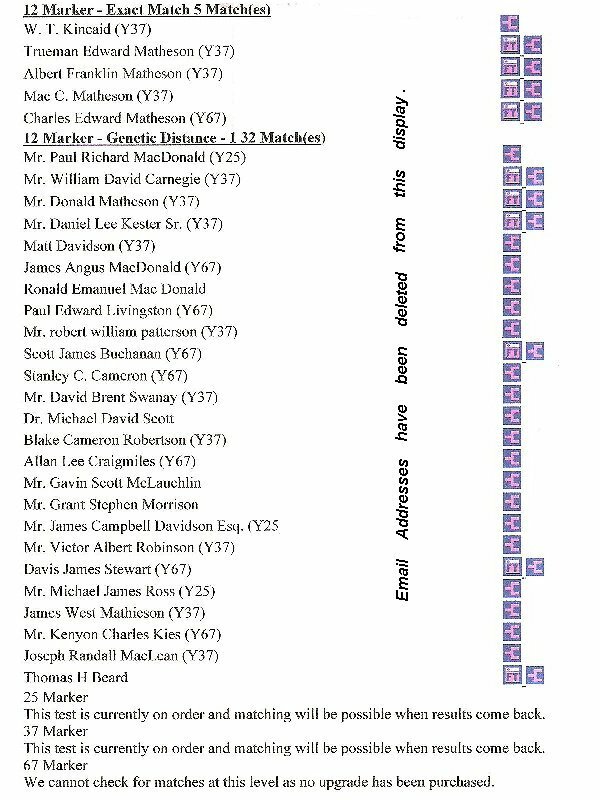 CLICK HERE for the updated/upgraded list of Y-DNA matches dated September 2, 2010. 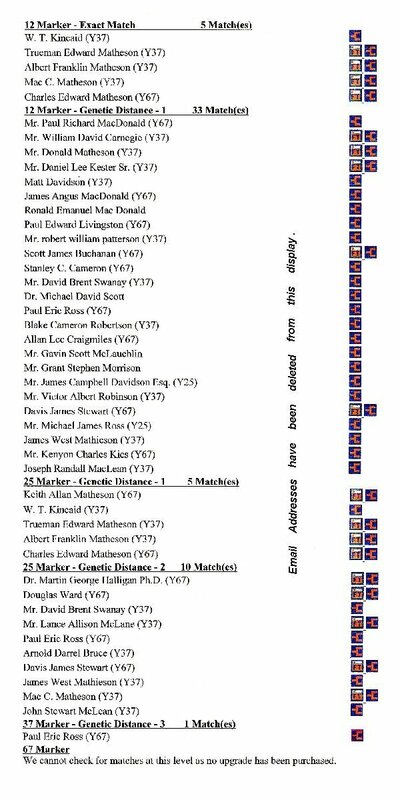 CLICK HERE for the full list of DYS markers from 1 to 67. CLICK HERE for the updated list of YDNA matches dated December 20, 2011. NOTE: Paul Eric Ross and I, according to the results of the matches on the September test, may consider ourselves to be cousins . . . or as stated in the email, "This means that there is a 99% likelihood you share a common ancestor in a genealogical time frame." "As the new Arizona Commissioner, I find myself in need of a new banner for the tent. The best picture I can find on the internet is a 9K JPEG which the flag company says is not high enough resolution. Do you have access to a picture of the badge in vector format, either EPS or AI format, or a higher res JPEG image? I have polled CRAUSA and have received no responses." The crest in my Newsletter folder was a 1122 K JPG file, and this was sufficient for Paul to have a 2' X 3' flag made by May 12, 2010. Prior to the date of my application for the test materials, I could predict that the DNA Analysis will show both a Pictish and a Celtic influence for my origins. A quick read of my Clan Ross history pages will provide the basis for this conclusion. There could also be some Viking influence on the Irish matrilineal results. 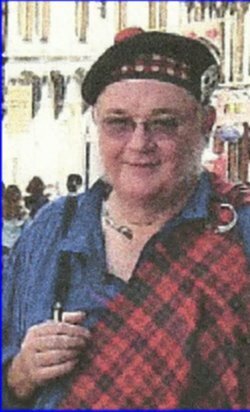 In June of 2012 I added an item to my Scottish Icons folder for Clan Ross Canada. The DNA Dichotomy in Scotland may have some bearing upon my prediction. I cannot say that I was too surprised, but it was very revealing. 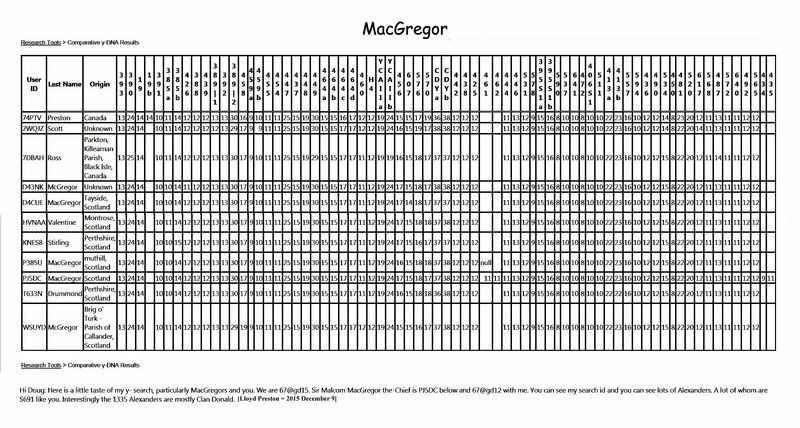 Here are other, more recent comparisons with the McGregor group at Family Tree DNA shared by Lloyd Preston in December, 2015.